"For anyone who doubts the importance of a conductor in operatic performances, this extraordinary set will settle the question. While the female singers are different in these two Met broadcasts, the principal males are identical (and only three years older in the second one). Under Max Rudolf we have a fine performance of Mozart's masterpiece, a performance that we would be very grateful to encounter in the opera house today. But when heard after George Szell's 1944 rendition, the difference between good and great is made all too real. The characteristics of Szell's conducting here are quick tempi, crisp articulation of notes and text, and most of all an incredible sense of true ensemble throughout. Musicians in the orchestra clearly listening to each other, singers genuinely interacting instead of merely singing their individual parts well, and even orchestra and singers listening to (and interacting with) each other. The precision of orchestral attacks and the clean transparency of passagework in the strings and winds is astonishing. These are the traits that have made the Cleveland Orchestra one of America's great ensembles, and here Szell creates it at the Met. But the charge of coldness, or lack of emotion, sometimes hurled at Szell is without merit here. There are many examples of actual tenderness (the orchestral introduction to 'Non mi dir', is one, the sensual conducting of 'La ci darem' another. The sharpness of contrast between the comic and the dramatic, so crucial to this opera, has rarely been as strongly made as it is here by Szell and his cast. Pinza, already 52 years old, is still in magnificent voice and doesn't sound in any way bored with the role despite having been identified with it for well over a decade. The sheer sound is, of course, one of the miracles of the vocal art in the 20th century. But as impressive is the relish with which he embraces every facet of the role: the seductive charmer, the evil schemer, the powerful overlord; all are present in this complex character. The balance between cruelty, wit, and sensuality is perfectly struck, and brought vividly to life through inflection, phrasing, and vocal coloration. Baccaloni's Leporello is another huge asset to this performance. He, like Pinza, is a master of every word of the text as well as every note of the music, and their interchanges are as close to real-life as opera can get. In addition, Baccaloni was a wonderful musician, with impeccable rhythm and pitch, especially when led by a conductor like Szell. With Pinza and Baccaloni one gets, as rarely happens in this opera, a vivid sense of a lifetime relationship between master and servant, with mutual respect based on their respective statuses in society but also on their intimate knowledge of each other's characters. Most successful is Bidu Sayao, whose Zerlina defines, for me at least, how to sing and act this role. Vocally exquisite, she also is the perfect lovable vixen. 'La ci darem' sung by her and Pinza is utterly believable and treasurable. Steber, Baccaloni, and Kullman are excellent in their roles too. Perhaps Kullman does not have the uniquely beautiful timbre or ridiculous breath control of McCormack, but his is a lovely lyric tenor that brings pleasure. He does struggle just a bit with the passagework in 'Il mio tesoro', but he is neither the first nor last. Mack Harrell is a superb Masetto, believable rather than the usual cardboard rural dummy, and Nicola Moscona is luxury casting as the The Graveyeard scene is truly chilling. Even without seeing them, one clearly distinguishes the voices of Pinza, Baccaloni, and Moscona, and the intense dramatic underpinning from Szell is positively gripping. Max Rudolf's performance is a valuable inclusion here - after all any Pinza performance of this role is worth having. Pinza, it must be noted, was 55 rather than 52, and even those three years can make a difference at that point in a long, active career. Pinza's voice has lost a bit of firmness, but is still a remarkable instrument and he does bring the Don to life as few others have. The role consists of a great deal of recitative, and Pinza relishes every word in a way that most singers simply don't approach. No phrase is thrown away; everything smacks of total involvement. The most interesting new voice here is Regina Resnik as Anna. We know her as a brilliant, dramatic mezzo-soprano, and may forget that she began as a dramatic soprano. She is believable and even thrilling as Anna, but the rapid notes in the second part of 'Non mi dir' do seem to defeat her. Despite that, hers is one of the most impressive performances of this cast. Lorenzo Alvary's Masetto is not as incisive nor cleanly sung as Mack Harrell's, but Jerome Hines is every bit as impressive as the Commendatore as was Moscona. As usual, Immortal Performances provides thorough and informative notes, and wonderful photos, including photos and brief biographies of every performer. This is a release of considerable value and importance. We don't have a lot of Szell in the opera house, particularly in his earlier years. 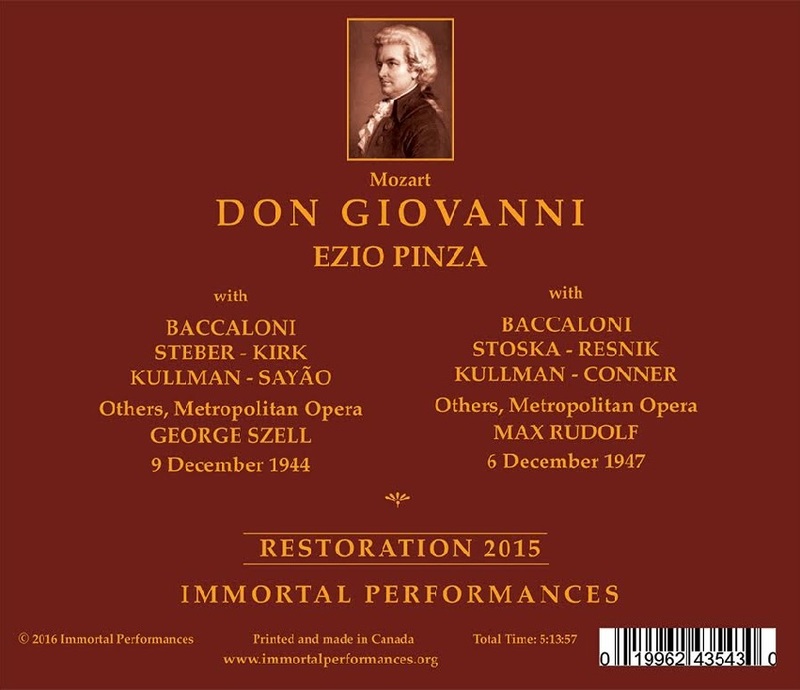 The opportunity to compare Szell and Rudolf, and dramatically see (and hear) the difference a conductor can make, is instructive, especially since Immortal Performances is selling the four discs for the price of three. 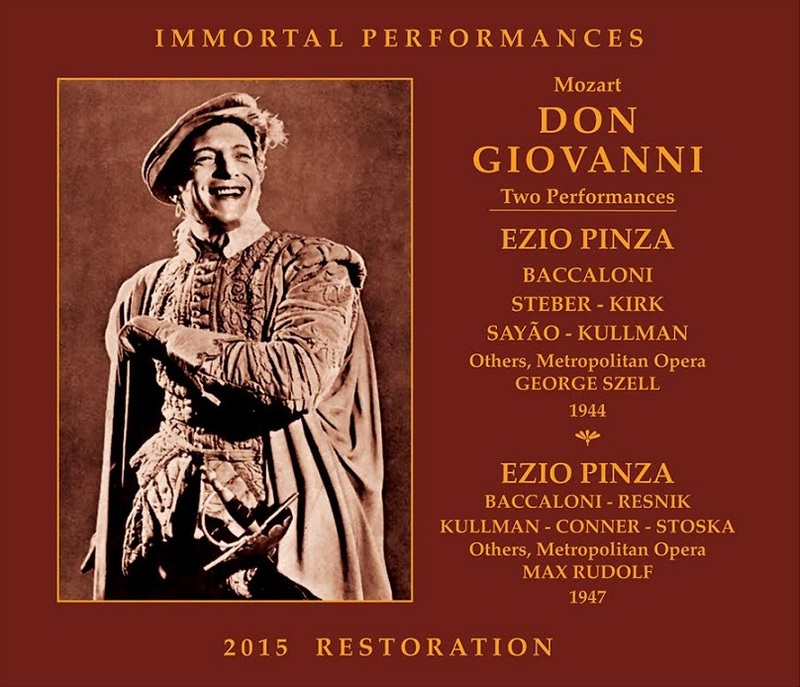 Above all, the Szell/Pinza DON GIOVANNI is a treasure, sonically restored better than ever." "Luckily, Steber would continue to add to her gallery of Mozart heroines for years to come. The  broadcast offers only her second Met Donna Elvira, but already it attains a high level of distinction of Steber's vocalism and musicianship there can be nothing but praise. 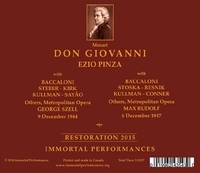 Kirk was no novice [as Donna Anna], having sung it in Buenos Aires and under Beecham in Mexico City. At her entrance she proffers a thrust of dramatic soprano steel (though a bit overheated). Temperament she has, as shown in Anna's accompanied recitative, and a spacious delivery which serves the vengeance aria well. Though Kirk would remain at the Met for four seasons, she was offered few opportunities, and the radio public hears no more from her. As for Pinza (the [1947 performance] is his last broadcast), nothing can dim his vibrant manner, though age has thickened his tone. As in every performance, Pinza never stops trying to give full value to his audience, and the champagne aria has the old brio. Of even greater interest is the Donna Anna of Regina Resnik. Her Metropolitan career would extend over three decades, two-thirds in the mezzo soprano range. Throughout the afternoon she proves herself a genuine seria heroine of resplendent tone and commanding manner. The big emotions, the grand manner seem native to Resnik. When she finishes her dramatic recitative and aria in act one, we are ready to place her at the top of our Anna hierarchy. The voice is beautiful, fruity, and without a hint of vocal inhibition."